The "Secret of the Hidden Glory"
We live in a swirling sea of magnetic forces, smaller fields contained within even greater fields, expanding throughout infinity. As our understanding increases, a new picture of the universe emerges ~ one of vast cosmic interdependence and connectedness. From first cosmic dawning to the last electron's feeble light, the whole universe is a complex of coils within coils, spirals within spirals, magnetic fields within magnetic fields. The stars are interconnected with each other, all flowing along magnetic field lines, the arteries of the galactic body. The galaxy's coiled field lines diverge into intergalactic space where they ultimately connect to other galaxies. Do these tendrils of energy act as the nervous system of the universe, relaying information from star to star, galaxy to galaxy, on and on? For Inspiring Audio version of the previous paragraphs, click here. To return here, if your browser takes you away to stream the audio, click "back" button after listening. For full instructions on listening to audio on the SouledOut.org website, click here. Zodiacal Deities examines the conditioning effects upon humanity by the specialized and quite unique energies of the star groups comprising the Zodiac. We hold these star groups to be conscious, living entities in whose greater bodies we reside. Traditionally the Zodiac is described as the imaginary path of the Sun through the heavens. This path "exists" only from our earth's perspective. If you were observing the path of our Sun from another planet or body in space our Sun would appear to be "traveling through" different constellations at different times of the year, to be on an entirely different path through the heavens. This path is largely an illusion but at the same time the 12 zodiacal constellations do exist as great beings, and the streams of energy which pass and repass, intermingle and interlock throughout space are by no means illusions. They express eternal cosmic relationships. The science of astrology is a study of the interlocking forces of all the 12 constellations as they pour into and through all the kingdoms in nature, carrying with them also their own individual qualities as well as those of the seven rays, focussed through the sacred and non-sacred planets of our solar system ~ the discovered and undiscovered planetary Lives. The vision of these powers and their many weaving lines, seen as rivers and streams of light, is given to the initiate from the mountaintop of Capricorn, once that summit is reached. As the various energies and forces circulate throughout the etheric body of our solar system ~ itself a Great Being ~ their effects depend on the state of the planetary centers, and upon the point of unfoldment of the centres within the individual planets themselves. Those great zodiacal entities who qualify life as we know it imprint their frequencies or harmonic resonance on the various vehicles that comprise a human being. The energies streaming forth from the constellation Capricorn express a crystallization process carrying the seeds of death, that give way to life through the initiation process. An earth sign, Capricorn produces the densest point of concrete materialization the human soul is capable of. It is the crystallization of this materialism that eventually reaches a "hardness" that shatters and is destroyed. Because of this fundamentally materialistic nature, the Capricornian eventually brings about their own destruction ~ at least of their material life ~ and awakens to the higher frequency of spirit and the nonform. Initiation is the result of this process, and the goat on the mountaintop represents this. In Capricorn the will nature arrives at fulfillment as a visioned goal is reached. The one born in Capricorn reaches either the height of personal ambition or becomes the initiate, attaining their spiritual objective. The difference between these two goals depends upon the mode of progression around the wheel of life. The disciple initiate incarnates upon the reversed wheel. 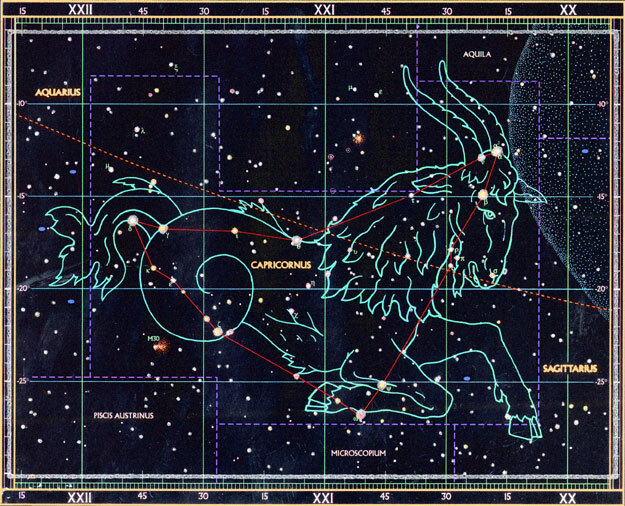 The mountaintop experience associated with Capricorn can also represent a new cycle of effort. Effort, strain, struggle, and any strenuous conditions entailed by the tests of discipleship or initiation ~ these are distinctive of experience in Capricorn. It is a sign of testing and proving oneself as Capricorn, along with Aries and Taurus, are the great transformers, acting as catalysts. Each of them opens a door into one of the three divine centres of expression symbolic of the three higher centres in humankind: the head, the heart and the throat. The polar opposite to Capricorn is Cancer and these two signs are the two great gates of the zodiac ~ Cancer opens the door into incarnation and human experience, while Capricorn opens the door into the life of the spirit and the Kingdom of God. Cancer admits the soul into the group of Humanity, as all souls take their very first human incarnation in this sign. Capricorn is regarded as another door and is called esoterically the "doorway into life of those who know not death," or those who will no longer incarnate. Capricorn admits the soul into conscious participation in the Life of that world centre which we call the Hierarchy. It is said, Capricorn guards the Secret of the Soul Itself, the Secret of the Hidden Glory. Some astrologers assign Saturn as one of the rulers of Capricorn, although it may be more accurate to address the Saturnian influence of Capricorn in those who have not yet taken initiation. The density and crystallisation process Capricorn signifies can certainly be said to be Saturnian qualities. However, on the reversed wheel, the Saturn influence exhausts itself in Capricorn and the initiate is then free from karma and stands free, a true Master Mason, and can proceed with world service undeterred by any thought of self or selfish desire. At that point, Uranus is the ruler of Capricorn. This influence will focus and develop the will nature as the initiate develops into a leader, bringing about desired changes enabling the soul of humanity to express itself more freely. Capricorn can express all the worst of which a person is capable, and all the best. It is a sign of extremes ~ all world Saviours are born in Capricorn ~ but also the very worst type of person ~ hard, materialistic, cruel, proud, selfishly ambitious and egoistic. The head rules the heart in such cases, whereas in the perfect example of the influences of Capricorn, head and heart are perfectly balanced. In Capricorn we have the triumph of matter; it reaches its densest and most concrete expression; but this triumph is followed by that of spirit. There is full expression of the earthly nature in Capricorn, but also immense spiritual possibilities. Capricorn rules the knees and this is symbolically true, for only when true humility is mastered can the disciple be permitted to pass through the door of initiation and be entrusted with the secrets of life. Only on our knees can we go through that door. When the person born in Capricorn can kneel in spirit and in truth, they are ready for the initiatory process upon the mountaintop. Mars is exalted in Capricorn, while the power of the moon is lessened, and Jupiter and Neptune both fall. 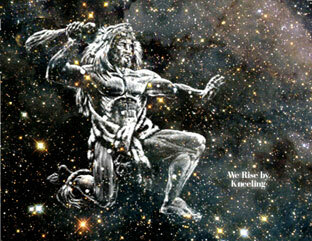 Mars is the god of war and in this earthly sign Mars triumphs in the early stages of undeveloped lives. 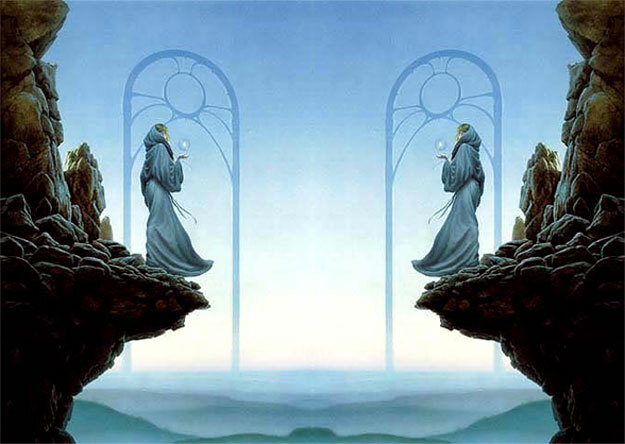 Materialism, the fight for the satisfaction of personal ambitions, and the conflict with higher spiritual tendencies go steadily forward, and this most material of all the signs is the battleground between the old ways and habits, and the new and higher inclinations and tendencies. But as evolution proceeds, the power of the moon, which is the symbol and ruler of form, grows less and less, and the disciple upon the reversed wheel steadily frees themself from the control of matter as the lure of all that is material wanes increasingly. Jupiter, which has been the ruler of Pisces and also of Aquarius, falls in this sign. Standing for the highest expression of love and selflessness, Jupiter reaches its lowest point of realisation in the dense materialism of Capricorn; this is what the "fall" represents. Later as the person evolves, transmuting personal desire to love of others, it is their lower nature that "falls." December, or Capricorn, is also associated with the birth of the Christ in the cave of the heart (the dense point of earth, or matter). As one awakens to this point of awareness, however dimly, the initiation process has begun and will eventually culminate in the great transformative sign of Capricorn. and this it reveals to the initiate at the time of the third initiation. This is sometimes called the "Secret of the Hidden Glory." It is interesting to note that during the time we say the sun is in Aquarius, from approximately January 20 through Februrary 19, due to the precession of the equinoxes, and from the earth's perspective, the Sun is actually traversing the zodiacal constellation Capricorn. With this consideration, we invite you to review the SouledOut.org materials on Capricorn freshly, from this perspective.